Heat oil in large nonstick skillet over medium-high heat until hot. Add chicken and onion; cook 5 minutes or until chicken is browned and onion is tender, stirring occasionally. Add all remaining ingredients except almonds; mix well. Bring to a boil. Reduce heat to medium-low; cover and cook 15 to 20 minutes or until chicken is no longer pink, rice is tender and liquid is absorbed. Top each serving with almonds. The first step in classic pilaf recipes is to brown the rice in oil or butter. 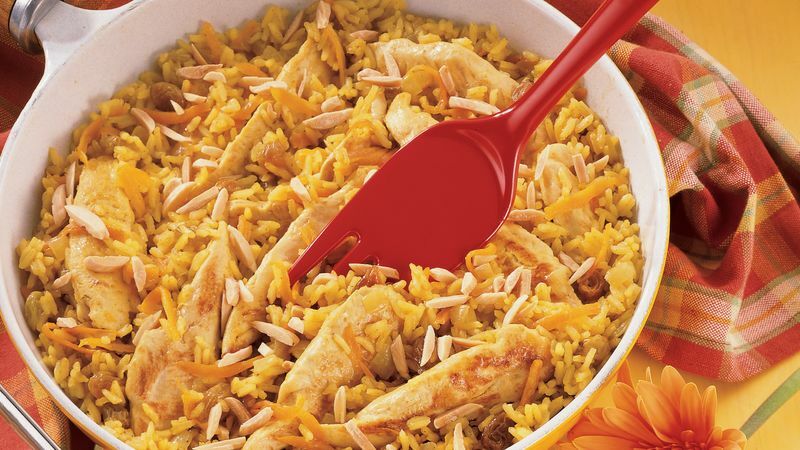 Although our streamlined recipe omits this step, the ingredients are traditional for a Middle Eastern pilaf. Chicken tenders are juicy, tender strips cut from the underside of chicken breasts. Look for packages of chicken tenders in the poultry section of the meat department. Shelled pistachio nuts can be used in place of the toasted almonds in this recipe. To toast almonds, spread on cookie sheet; bake at 350°F. for 5 to 7 minutes or until golden brown stirring occasionally.